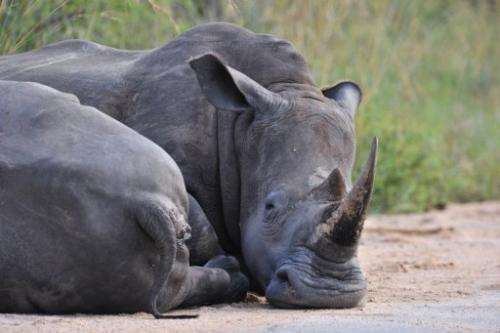 Photo taken on February 6, 2013 shows rhinoceros resting in the Kruger National Park near Nelspruit, South Africa. Poachers have killed over 200 rhinos in South Africa this year, the environment ministry said Wednesday, as a major security operation fails to curb illegal hunting for the rhino horn trade. Poachers have killed over 200 rhinos in South Africa this year, the environment ministry said Wednesday, as a major security operation fails to curb illegal hunting for the rhino horn trade. The world-famous Kruger National Park was the hardest hit, with dozens of raids by poachers. "This is like full scale war that's raging in that park," environment ministry spokesman Albi Modise told AFP, after 56 incursions were recorded by rangers in just 12 days in March. The toll since the beginning of the year is now 203. Even soldiers and police with helicopters deployed to stop the slaughter struggle to secure the vast reserve, which is roughly the size of Israel. Last Sunday a mutilated rhino cow was found "bleeding profusely from having its horns, entire mouth, tongue, nose and eyes hacked off and had to be euthanised", the ministry said in a statement. A poacher was killed in a shootout the same day, while another is believed to have committed suicide. At the weekend, five soldiers died in a military chopper crash during an anti-poaching operation. Sixty people have been arrested this year. The lucrative Asian market for rhino horn drives poaching in South Africa, which has the largest rhino population on the continent. Asian consumers falsely believe the horns, the same material as fingernails, have powerful healing properties. The killings have escalated from 13 poachings in 2007. Last year, 668 rhinos were killed.